I THOUGHT this week I would look at clothing shops over the years. I am sure you all have your favourites, and I suspect I will leave some out. In 1959, Kelly’s street directory had a section on outfitters and clothiers – not a title we would think of today. 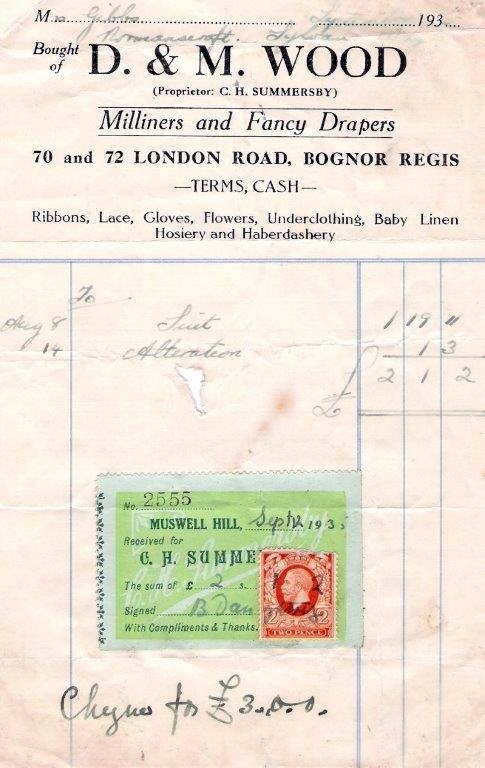 Under clothiers, I found Hepworth & Son in London Road and the Longford Clothing Stores in Longford Road. And, of course, one of our longstanding shops, that of Hanford’s. Can you imagine paying 29s 6d (£1.50) for a suit, which was even guaranteed to fit? Well, this was the price that was advertised by Joscelyn Hansford in his shop in London Road in 1908. In the 1920s, advertising for the trader included the phrase, ‘the shop for young men and men of youth’. By the 1930s, gentlemen’s suits had increased in price to 37s 6d (£1.88) with coats costing between £2 2s (£2.10)to £8 4s (£8.20) for a top of the range topcoat. Hanford’s always appeared to remain with the current day’s fashions and again in the 1930s it was possible for 3s lld (20p) to purchase a shirt complete with an attached collar. At that time it was rare for shirts to have attached collars, because collars tended to wear out before the shirt and therefore by having collars, which detached, the shirt could be worn for longer. Buying off ‘the peg’ is now the style that is accepted for everyday use. This was a family name that offered a personal service in what seems to be a bygone age. Hanford’s is a name that is still remembered with affection by its customers. However, you can still obtain their unique service in Chichester at 17 South Street. Next, we will look at Burton’s. We should remember that at the period, between 1918 and 1939, there was massive unemployment and the time was to become known as The Depression. There were miners’ strikes, a change of government, the Wall Street Crash and other national milestones. The company was established in 1903 and later they supplied the British Army with uniforms both in the first and second world wars. They even supplied war veterans with their first suit, shirt and tie, post war, which was named The Full Monty – not something that is equated with this term today. During the Second World War, they were known as demob suits. At one time, 10,000 people were employed, producing over 30,000 suits a week. The secret of his success was that he offered high-quality made to measure suits at low prices. His slogan for many years was – ‘A five guinea suit for 55 shillings’. I recently read another report regarding the arrival of this store into the High Street, which referred to Burton’s as ‘this cathedral of commerce’. Sadly, this company closed down last month, both in Bognor Regis and other towns. Coplestone House was at the end of Sudley Road, at the junction with the High Street. This was a ladies clothes shop, which apparently was ‘very high class’ I have been told numerous times. You could obtain a card to shop there, but some people had the card, but could not afford to shop there because of the prices. Town centre stores will always evoke memories and for Bognor Regis residents and visitors alike we have the names of Marks & Spencer, Littlewoods and New Look. In 1936, there must have been some consternation when a private house known as The Lawns had its garden wiped out by the building of new buildings and stores. this new construction was for use by M&S and Burton’s. The building, from a planning point of view, was completely out of keeping with the rest of London Road. The local press in July, 1936, announced the opening of the new ‘Super Store Marks and Spencer at No 4 London Road’. M&S advertised that in their store there was ‘nothing over 5s (25p) and also extolled the fact that 90 per centof their goods were British’. When television advertising started in 1955 M&S resisted this medium, relying purely on reputation. Ultimately, in the mid-1990s, their first TV commercials for clothing were aired to lead to today’s food and clothing advertised with the addition of national personalities to promote their goods. The company peaked late in the 1990s and then the company shares began to drop, and boardroom changes ensued. M&S left Bognor Regis with a shock announcement to the staff only minutes before the customers arrived, in August, 1990. At the same time, it was announced they would be opening a second store in Chichester. The people of Bognor Regis felt they had lost a friend, someone they could reply on for their needs. Soon, the building was to be the home to another High Street store – that of Littlewoods, which to some people had been seen as not of the same standard of M&S but, nevertheless, able to serve the needs of the customer. The Littlewoods empire was similar to M&S as a family concern. Therefore, in 2005, there was another shock for shoppers, when it was announced that nationally the well-known institution of Littlewoods was to be sold. For Bognor Regis, it was announced that New Look would be moving across the road from their small store to the larger building. As a privately owned company, they had purchased 34 of the Littlewoods stores to assist with their UK expansion. Staley’s was a store situated in the High street next to Reynolds and eventually moved into new premises at the junction of London Road and the High Street and became known as Bobby’s for many years and today is well known as the national chain of Bon Marche. Over the years there have been many small ladies’ clothes shops and men’s outfitters including Shirley’s situated in Linden Road, alongside Woods the Drapers, Lemmon’s, William Grace, outfitters and I am sure you can remember more. While writing we have two new stores opening – Trespass, with outdoor clothing, and Yours, ladies clothing, to continue the trend. *I will be giving a talk on Bersted’s past at the annual electors’ meeting at 7pm next Tuesday at the Bersted Jubilee Hall in Chalcraft Lane.